As the college football season nears, EA Sports’ first of their two football games hits store shelves in NCAA Football 14. 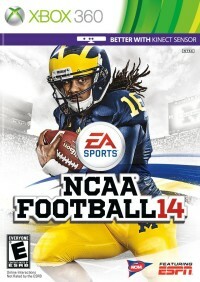 Featuring a new mode as well as physics engine, NCAA Football 14 ends this console generation on a good note. The Infinity Engine made a promising debut in Madden NFL 13 last year, although its major flaws were easily visible in replays that showed every hitch and oddity that the physics animation engine produced. NCAA Football 14 gets the first crack at Infinity Engine 2, which fixes those issues so tackles and collisions are a lot more natural than they’ve ever been in an EA football game. Finally, the canned animations of past NCAA Football games are all but gone, and that’s an awesome thing to see. With the help of Infinity Engine 2, offensive players take advantage of their newfound freedom with some new moves. Quick cuts are now a thing that running backs and anybody else with the ball on offense can do to try to punish defenders that are slow to anticipate your every move, which helps give ball carriers a sense of agility that wasn’t there before. To go with that, the boost button has basically returned with the new stamina system that lets you gain a burst of speed to shoot through holes or around the edge of the line with the caveat that if you empty your stamina bar, you may end up tripping or fumbling the ball upon being tackled. The option has been given something of an overhaul so that you can now pitch the ball to either side of your QB, and new indicators will point out the important defenders that will try to break up the play. These changes help lower the barrier to understanding the popular option offense — much to the chagrin of online players around the world. As for new features, Ultimate Team has finally made its first appearance in the NCAA Football series with a really unique hook to it that makes it kind of awesome. Rather than earning cards for nameless current players, the roster you’ll build only contains former players, which essentially lets you build a team of former college all-stars. This gives your starting deck a lot more name recognition than you’d get early on in Madden’s version of the mode. The downside is that you likely won’t see any one school have a complete set covering every position, so the collection part of the mode is quite lacking. The collections they do offer mostly center around collecting a random set of cards with some theme that sort of connects them like the conference they’re in or their mascot, which sort of kills the good idea that your extra players or duplicates in Madden Ultimate Team were still useful in helping you complete collections. Now those players are just a waste of space unless you cash them in for coins to buy more card packs. The Dynasty mode received two major upgrades that really add some punch to it, though the most impactful change for me may be a surprise. The recruiting system has been a huge, tedious mess in the last few years because you'd need to spend 15-20 minutes after every game properly addressing your recruiting board. This year, they’ve thrown out the meticulous nature of that feature and just let you choose the amount of time you’ll spend on each player and let the game handle the rest, which means that you can spend just three or four minutes after each game if you want so you can get back to the fun more quickly. The other big change in the Dynasty mode is that coach progression is now handled more like an RPG with skill trees that you spend skill points in to enhance certain aspects of your team. When you upgrade your recruiting, it's akin to emulating the effect that veteran coaches can have on their team and program as a whole. You can start as a rookie offensive coordinator who has to earn these bonuses or start with a veteran head coach, and the difference between the two is definitely noticeable. The one knock that I have for this is that the XP pop-ups for every milestone you hit in each game show up in the middle of the screen, which is kind of obnoxious. It is excusable only because the pop-ups are relegated to TD celebrations and in-between plays. Despite all of the new stuff here, the Road to the Heisman mode is a huge disappointment. There has been almost nothing done to that mode in the past few years, and playing through a full senior high school season before even getting to the college of your choice is a tedious chore that just isn’t fun anymore. It’s still really easy to start your college career with high stats that you can max out way too fast. Defense is still quite hard to play well, as you’re more or less just hoping the play comes your way so that you have a chance to do something. As we head into the next generation, NCAA Football 14 is a very good way to cap the series for this generation. Ultimate Team is a cool, new mode that has been adapted well for the college game to be more of a celebration of the former star players we loved and hated watching every Saturday. Infinity Engine 2 breathes some new life into the gameplay by getting rid of the stale animations that we all grew tired of this generation while mostly avoiding the awkward animations that plagued Madden last year. This year’s game brings a lot of good stuff to the table to make it yet another solid, quality entry in the series. It offers new, bigger features than we’ve gotten in the past few years which helps makes it a worthy purchase.